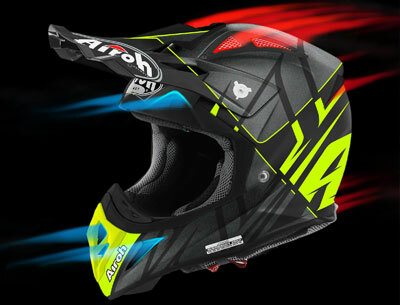 The Airoh Aviator 2.3 is the most advanced motocross helmet line of the Italian brand. The renewed aviator helmet is equipped with top quality technical features. A size medium only weighs 1070 (+/- 50) grams. More information about the technical properties can be found at the bottom of the page. The Airoh Aviator is a top quality motocross helmet. Every helmet takes hours of manual work, which is performed by the experts at Airoh. The Aviator is one of the few motocross helmets that is produced entirely in Italy. The most important technical features are explained below. One of the best features of the Airoh Aviator 2.3 is comfort. The first thing you will notice when putting on this helmet is the low weight. This is not only very comfortable, but also minimizes fatigue in your neck. The inner lining is made of advanced material. It feels comfortable and adjusts to your head automatically, offering a good connection around your head. The inner lining is also designed to provide maximum ventilation and sweat absorption. The absorbed sweat is then drained through the excellent ventilation system. The Airoh Aviator 2.3 is made from an advanced carbon fibre composite. 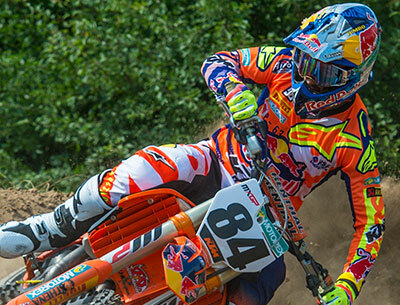 Carbon has the lowest weight of all composite materials used to produce motocross helmets. This has a positive effect on the protection of the riders, as there is less mass hanging on your neck during an impact. The carbon shell is produced in a unidirectional pattern. This ensures strength in all directions. The shell also features a Kevlar layer. This is the same material used in bullet proof vests, because it is very good at stopping objects. The Kevlar in the Airoh Aviator 2.3 prevents objects from piercing the outer shell. With the new Airoh Aviator 2.3 much attention was spend on the ventilation system and breathability of the inner lining. The helmet has several ventilation openings at the front, top and back. Especially the upper ventilation holes provide a lot of cooling, since warm air can rise directly from your head and flow out. The ventilation can also be adjusted by the 2 covers that are supplied with the helmet. These covers can be screwed onto the large upper ventilation openings. Ideal in cold weather or in heavy rain. The mouthpiece of this Airoh motocross helmet has a dust filter. The built-in dust filter will help each rider perform by blocking sand and dust from the incoming air. Airoh spend a lot of attention on the protection during the development of the most recent Aviator motocross helmet. One of the changes is the use of damping foam with multiple densities. This will give the motocross helmet a progressive damping during an impact. The first layers is made of low-density material, which is very good at damping impacts with low energy. The second layers has a higher density, which is designed to dampen the high energy impacts. The two layers work together to provide optimal protection to the rider. On the lowest layers the inner lining is placed. The inner lining of the Airoh helmet can be removed in the event of an accident. The pull tabs for the emergency system are easily visible because of the red color. It can be found at the bottom of the helmet, at both cheek pads. 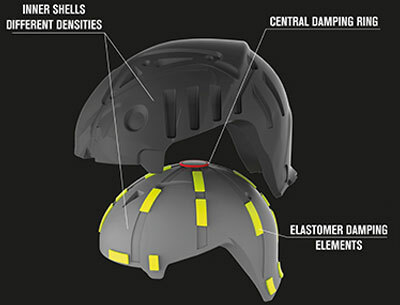 Traditional motocross helmets are designed to dampen a direct impact. However, research shows that an impact under an angle can created harmful rotational forces. Traditional motocross helmets do not dampen this rotation, which means the energy is directly transferred to the riders brain. The result is serious risk of concussions or worse. The new AMS-2 system from Airoh is designed to reduce this risk. The two shells, with multiple densities, are designed to rotate separately from each other. The rotation movement is damped by means of several elastomeric elements. The rotation acceleration will therefore take longer, causing the peak stresses in the brain to decrease. 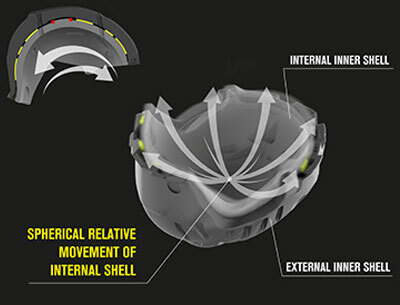 The Airoh system is comparable with the well-known MIPS system, which is built into more and more motocross helmets. Thanks to the new Airoh AMS2 system, the protection of the Airoh Aviator 2.3 has improved considerably compared to the previous versions. The Airoh Aviator 2.3 is designed with the feedback from the best motocross riders in the word. It has many accessories and features that help riders perform. One of the accessories that comes in the box is the extended helmet peak. This can easily be screwed onto the standard peak for extra protection against flying sand and stones. In addition, the extension can also come in handy when the sun is low. 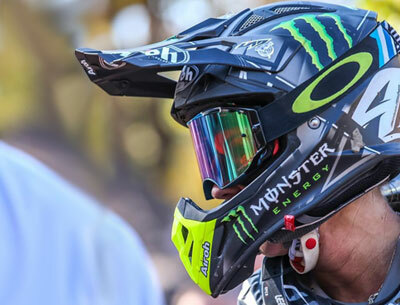 The motocross helmet also features a large eyeport, the opening at the front of the helmet. A large eyeport helps the rider perform by offering maximum field of view. The large eyeport also ensures compatibly with almost all motocross goggles, even the big ones like the Oakley Airbrake and Scott Prospect. Airoh has its own design department that makes the most beautiful designs. Together with the aggressive styling it provides the most awesome motocross helmets on the market. In addition to the standard collection, Airoh sometimes introduces limited editions. These editions of, among others, RACR, Antonio Cairoli and Six Days, are only available in limited quantities. Choosing a new motocross helmet can be difficult with the wide range of brands and models available. Do you have a question about the Airoh Aviator or one of the other motocross helmets? Feel free to contact our customers service, we are happy to help you. Because of our large range, there is always a helmet available that meets your requirements.